Writer Dava Sobel pushes students to get the most out of their language. 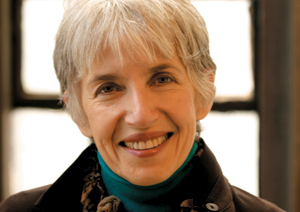 “Why are we reading poems today?” Dava Sobel glances around the room at her silent students. A small, glamorous woman with white-gray hair and maroon lipstick, Sobel looks like a poet. In fact, she is a former New York Times science reporter and the bestselling author of Longitude (1995), Galileo’s Daughter (1999), and The Planets (2005). She is also the Committee on Creative Writing’s sixth Robert Vare writer-in-residence; her Winter Quarter course is called simply Writing about Science. Behind Sobel looms an enormous video monitor, a remnant of Rosenwald Hall’s previous occupant, the Graduate School of Business. (Built in 1905 for the departments of geography and geology, Rosenwald also retains a tower that once held meteorological instruments.) Opposite the TV stands a bank of Gothic windows, encased in practical, if unattractive, double-glazing. Sobel’s students are settled around five tables pushed into an enormous whole. Sitting in on the course, Steve Koppes, a science writer in the University’s News Office, and Sobel’s husband, ballroom dancer Alfonso Triggiani, choose desks against the wall, at a tactful distance from the group. Sobel suggests starting with “Diffraction” by Diane Ackerman. Six students shuffle through their papers. The other five flip open laptops. With the readings on electronic reserve, print is optional. “I think we should have some dramatic readings,” Sobel says. Third-year Jared Sagoff volunteers: “When Carl tells me it’s Rayleigh scattering / that makes blue light, canting off molecular / grit, so slowgait through the airy jell, subdued / ...how I envy / his light touch on Earth’s magnetic bridle...” At the end, Sagoff glances up at the group as proudly, yet humbly, as if the poem were his. “An anti-science poem,” offers Sobel. The students squint at printouts and laptops, counting parts of speech. Outside the Gothic windows, a thunderclap booms like a sound effect. The class guffaws. THE THREE-HOUR CLASS BREAKS MIDWAY THROUGH. Back in session, Sobel announces there is another poem to read, “We Walk on Fire”—and that the poet is in the room. “I sent it by e-mail,” third-year Danit Kaya, who serves as Sobel’s research assistant, explains. “It was sent on February 7,” says Kaya. “At 4:54 p.m.,” one student says.“4:52,” says another. “Why not the author?” says Rassbach. “That would give it all away,” says Sobel. It’s Sagoff, who reads the piece again at the class’s request—then smiles the way he did after reading the Ackerman poem, except this time the poem really is his. Near the end of the session, the students take turns reading stanzas from Erasmus Darwin’s “The Botanic Garden,” the longest poem on today’s list; the two-part work was written between 1789 and 1791. Available most readily from less authoritative online sources—sites like PoemHunter.com, ReadPrint.com, FirstScience.com—such older, more obscure poems, are especially challenging to recite. “My plumy pairs in gay empvoidery dress’d,” reads one line in Darwin’s poem. Empvoidery? Poetic neologism? Typo? Both? The reading list for Writing about Science’s class on science included, in alphabetical order, “Diffraction” by Diane Ackerman; “The Botanic Garden” by Erasmus Darwin (grandfather of Charles); “The Star-Splitter” by Robert Frost; “Model of the Atom,” “The Element Refugees,” and “Building the Periodic Table” by Jennifer Grisham; “Just This,” by W. S. Merwin; “Sonnet: To Science” by Edgar Allan Poe; “Planetarium” by Adrienne Rich; “December 27, 1966” by L. E. Sissman; “A Poem Sacred to the Memory of Sir Isaac Newton” by James Thomson; and “When I Heard the Learn’d Astronomer” by Walt Whitman. Grades for the course, offered through the Committee on Creative Writing, are based primarily on a major project due at the quarter’s end. Jared Sagoff planned to write a chapter of a book on clams; Rob Mitchum, a book proposal about the influence of psychoactive drugs on musical creativity; Bihui Li, a magazine article on “quantum suicide”; Zachary Binney, a series of radio pieces on contemporary science topics; and Jessica Winter, a “short, accessible intro to calculus.”—C.G.